Thermal flow meters use a constant temperature differential (∆T) technology to measure mass flow rate of air and gases. 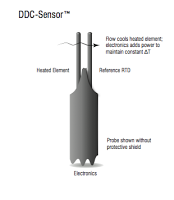 The thermal mass flow sensor consists of two Resistance Temperature Detectors (RTD’s). The sensor elements are constructed of a reference grade platinum wire wound around ceramic mandrels that are inserted into stainless steel or Hastelloy tubes. heat the mass flow sensor, or heated element, to a constant temperature and measures the cooling effect of the gas flow. The electrical power required to maintain a constant temperature differential is directly proportional to the gas mass flow rate. The microprocessor then linearizes this signal to deliver a linear 4 to 20mA signal. technology they call the Power Pro™ Sensor. Their sensor operates at a higher power level than other competitive thermal technologies, providing better response time and wider turndown. When compared to a typical differential pressure type flow meter, as shown to the right, the Power Pro™ Sensor offers better low flow or low end sensitivity. The Power Pro™ Sensor also provides exceptional accuracy at high velocities - up to 50,000 SFPM air. The Fox DDC-Sensor™ is a new state of the art sensor technology used in the Fox Model FT1 Thermal Gas Flow Meter. The DDC-Sensor™, a direct digitally controlled sensor that is interfaced directly to the FT1 microprocessor for more speed and programmability. 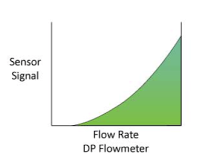 Like the Power Pro™ Sensor, the DDC-Sensor™ accurately responds to changes in process variables (gas flow rate, pressure, and temperature) which are used by the microprocessor to determine mass flow rate, totalized flow, and temperature. In addition to measuring flow, the DDC-Sensor™ provides a technology platform for calculating accurate gas correlations. The FT1 correlation algorithms allow the meter to be calibrated on a single gas in the factory while providing the user the ability to select other gases in the Gas-SelectX® gas menu. 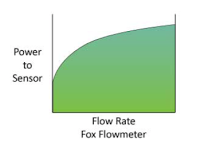 Fox’s Model FT1 with its DDC-Sensor™ and state-of-the-art correlation algorithms provide an accurate, multi-gas capable thermal flow meter for gas applications. Thermal Mass Flowmeter and Temperature Transmitter from Classic Controls, Inc.